I had my new alpaca 'fingerless gloves with mitts extension' on and have discovered that I can get my smallest Muji pencil case into the zip pocket of my Rohan fleece. So with my Derwent sketchbook tucked up the sleeve of my jacket I went for a bag-free walk. Well that's not counting the camera bag! I discovered a sign in the eastern park of Victoria Park which says what I've been calling a pond is actually a lake according to the Victoria Park Anglers Alliance (VPAA) - which is a biodiversity oriented voluntary community group. What's nice is they've got quite a decent website which tells me (and you) a it more about each lake. The East Lake bit of the website indicates where it is and has some photo albums which explain the work they've done to rehabilitate the lake. The lake is stocked with Tench, Rudd, Roach, Crucian Carp & Perch- mostly small fish with the aim of getting more bites (in contrast to the West lake). The West Lake has quite a history and this album has historical photographs of the lake dating back to the Victorian era when there was a pagoda. I wonder if they built it around about the same time that Kew acquired its pagoda? I think the Pavilion Cafe must be where the West Lake boat house used to be. 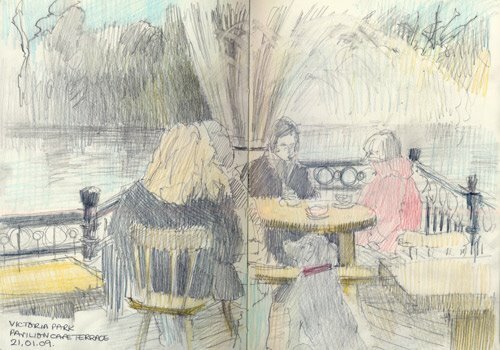 I had my cappuccino at the Pavilion Cafe half way through the walk and sketched more of the Lake Side People - and a dog! Plus the really good news is that I was right first time and there are moor hens in my "Moor Hen Pond" at the Ecology Park - so no need to change the map - phew! Guess who's started drawing birds? I'm very tempted to start a series of drawings of coots. 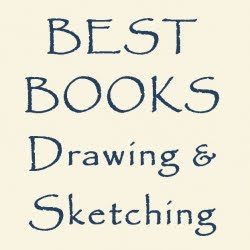 I thought that people who mainly follow my sketchbook blog might like to see how sketches get converted into more formal drawings which are currently being posted on my other blog - Making A Mark. 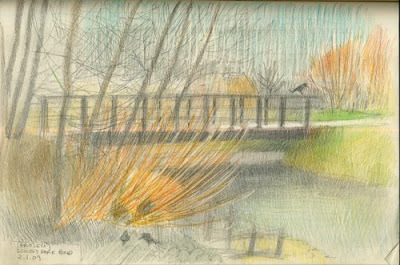 Plus another couple of drawings which I've been able to do because of my growing familiarity with the Ecology Park Pond. sketches done in cold weather are never going to be as good as those done in when it's warmer - if only because I've got a tendency to hurry the sketching or to pack up before I've finished because I've got too cold! the format of my sketchbook and the size I've been working are not quite the same. Maybe time to think about cutting up some paper to the right size and/or same format? more formal drawings usually have a more defined and definite value pattern - with the darker values worked up better. That's partly because it takes quite a time to get good darks on the bond paper in the Daler Rowney black sketchbook which I like to use (because of its smooth bond paper - coloured pencils skate across the paper very fast!). 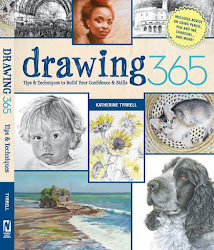 Some things to think about the next time I go sketching! 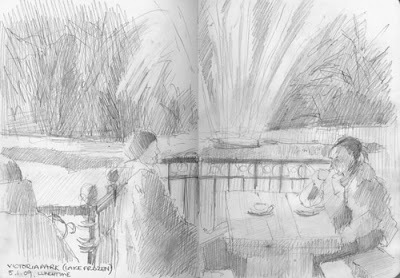 This sketch was done on 2nd January at midday and is of the view to the left of The Ecology Park Pond in December - but it's been drawn with me sat on the same seat. The names of the pond and bridge have emerged since the sketch - see below for more about the 'naming of parts' and a map of what is where in this complex of ponds! It was bitterly cold again and too cold to hang around for long so having got the pencil sketch done, I took a photo of it on the ground (see right) and then started on the coloured pencils - but gave up when I got too cold. In the current cold snap it's been fine to be out if you keep moving but it gets very cold if you stop to sketch! I often put my sketch on the ground in front of a subject to see whether it looks similar as I get further away from the sketch - it's a very good test of proportions. I've finished the drawing which relates to this sketch - but the light has been too bad today to do any photographs of it. Today, I've got posts on two other blogs about the Ecology Park Pond series - they both have the same name but they vary somewhat as to topic. 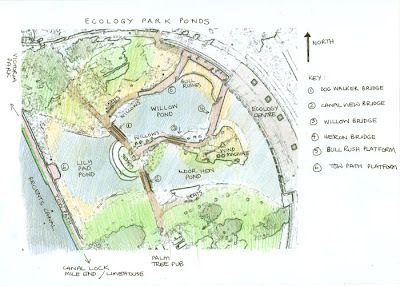 Making A Mark - The Ecology Park Ponds - an introduction. This covers the location of the ponds and a couple of maps one of which is reproduced above. I decided to have a 'naming of parts' because it could get a bit confusing as to which pond was which and which bridge was which! Watermarks - The Ecology Park Pond Series - an introduction - this provides a summary of what I hope to be doing - in terms of subject matter and media - with this series. It also has some photos of the ponds. You can also see photographs of the Ecology Park Ponds in a new set which I've published on Flickr - see The Ecology Park Ponds. Flickr - The Ecology Park Ponds. 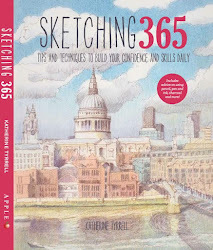 The 21st Worldwide Sketchcrawl is today! The 21st Worldwide Sketchcrawl is today - the 10th January 2009. You can find out where sketchcrawls are taking place by consulting the 21st World Wide SketchCrawl in the Sketchcrawl Forum. although this year Sydney - Australia is more active than Los Angeles! In San Francisco we are trying something a little different this time around, instead of meeting at the beginning of the day in a large group we are planning to meet at the end of the drawing day … the idea is to go on our own separate adventures and reconvene to share them. And by the nature of things - I've not got this posted before Sydney starts to post its RESULTS! You can always have your own tailor made sketchcrawl. Find a time slot in your day and then work out what you can do within that - and the constraints of your local environment and weather. 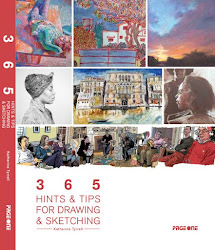 -Anyone can participate, be it to draw for 20 minutes or the full day. I'm waiting to see what the weather does as it's been far too cold to sketch outside all week and I'm not keen on indoors sketching in a Museum on a Saturday - plus I've got 'things to do' today. I'm also going out a week on Sunday with my sketching group for a sketchcrawl around Spitalfields so I think I'll probably stay close to home today. If the weather gets better I may well go for a "four ponds sketchcrawl"! Today it was finally warm enough for me to risk going out for a walk - as in the temperature got above freezing. It's been very, very cold for the last few days in London with newspapers now reporting that some parts of the UK are experiencing the coldest temperatures for 20 years. I struggled for hours this morning while trying to renew and install my security suite. In the end I decided I needed to just walk away from the problem and go for a good long walk - and wait for the support people to sort everything out. Then I walked across to the Lake - which was also frozen except for the bit in the middle where the fountain was keeping the water moving. I can't remember the last time I've seen it frozen like that - it's been many, many years. It's a large expanse of water and it sometimes freezes around the edges but nothing like it was today. 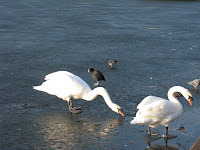 The swans and other birds were standing on top of the water and finding it difficult to locate water to 'hoover'. Although above freezing it was still far too cold to sit outside and sketch (I've identified the thermal long johns I need - I've just not got them yet!) 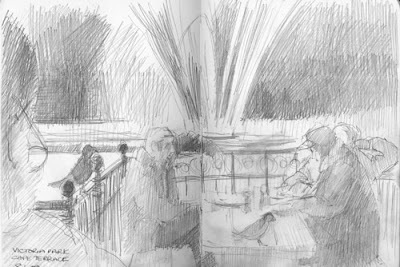 so I dived into the Pavilion cafe for lunch and sat and sat at the window and drew people on the terrace outside - overlooking the lake and the fountain. I ha d a lovely Chorizo, hummus and spinach stew with granary bread while I sat and sketched. The people in the cafe were a complete mix of Yummy Mummies with teenie tinies and old East Enders - a sign of how the area has changed in the last 25 years. It struck me this might be quite a good spot to do a series of sketches of people all occupying the same space. So having done my first sketch of a couple of yummy mummies, I proceeded to a sketch of three people having lunch. They were joined by a couple of very friendly pigeons. I think some of the birds in Victoria Park have a goal of making the leftovers from the cafe their staple diet! On the way home, down the Regents Canal, via the Ecology Park Pond, I found yet more evidence of just how cold it has been. 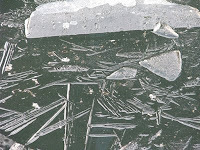 The canal was all churned up suggesting that there has been some movement of canal barges - and the ice was quite fascinating as a result. 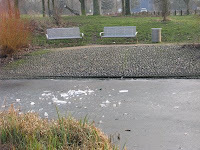 In the Ecology Park everything was frozen solid - except under the wooden bridges where the moor hens had taken up residence. I discovered a new way of going sketching today. I put a pencil and a pen in the zip up pockets of my fleece. Then I use my new smaller Derwent sketchbook - and that will just go inside the sleeve of my warm furry lining jacket with the rib cuffs at the end of the sleeves. Which means I can walk around with no backpack. Yippee. I think winter sketching means more sketching in pen and graphite and less in coloured pencil - well until it warms up a bit! Note: The Pavilion Cafe comes highly recommended by me - just what this area needed! Here are a couple of reviews from Time Out and The London Review of Breakfasts - which is a blog which is new to me! The menu board suggested they catered for both those who like a major fry-up at breakfast or the alternative healthy veggie blow-out version. Read the comments for the breakfast review! The surface of the Ecology Park Pond had a very thin sheet of ice over the centre when I visited it last Sunday afternoon. These are the reeds to the right of the last sketch and I've turned about 60 degrees to the right to sketch them. I spent about 15 minutes on this one and then decided I was absolutely freezing despite the many layers of clothing and that I needed to start moving. I did a complete tour of all three parts of the the pond to see what the views were like from different angles. I've never done this before and was pleasantly surprised at how many really good views there are. As a result I've decided that what I'm going to do is have the whole pond as my subject and I'm going to keep touring round the edges and doing sketches from different angles as there is lots and lots of potential material there and it would be silly to waste all that by just doing the same view all the time. 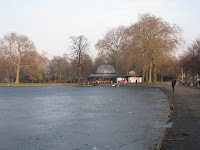 However I'm also going to have one view which I'll try and do at least once each month and that will be the first one I did on Boxing Day - The Ecology Park Pond in December. I've decided that I'm also going to take photos of the pond through the year as well as sketch it so that I get a better sense of what it looks like at different times of day in different months of the year. I'm getting the photos organised so that they'll be on Flickr and be accessible to public viewing. I think I might do a set for each month. There again - there are three parts to the pond and different perspectives and different times of day - so lots of opportunities to ring the changes on Flickr sets! 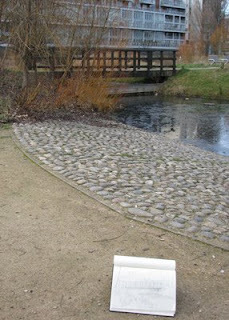 I'm also going to do draw a map of the pond so that I can then annotate it and say where I was when doing each sketch. What's going to be very helpful about going to the same place a lot is that I'll get very used to colours and will be able to use photos to develop drawings when the view is of a location where it is difficult to sit. Especially those where you have to stand for any length of time - as that's something I cannot do with my very dodgy feet, particularly when it's cold. I love my sketching but I'm not about to risk having another spontaneous rupture of my instep for sketching!!! Drawing ice is difficult! In the end it seemed to me that where there was ice, the water was completely opaque ice whereas in the places where there was no ice - at the edge, next to the reeds - the water had reflections and also developed little ripple marks as the breeze blew across it. This may seem obvious - but when the water was glassy still it really wasn't quite so obvious. I've decided that drawing water is also about drawing what surrounds water and what grows in water. Drawing reeds is also difficult when it's cold. They all look the same to start with and all look like they're all the same colour. Then you realise they're all a bit different in terms of how they're growing and the colours change slightly depending on which clump they're in. But none of that it recorded in this sketch - however hopefully I'll get better with time! 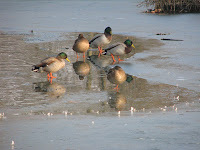 The ice also had a steely blue tinge to it while the areas of water which had reflections of the reeds was a very murky olive green/brown. I need to find a pencil which is near that colour as I can see I'll be using it a lot. My recollection is that Caran d'Ache do a lot of good colours in the range of olive brown that I need. 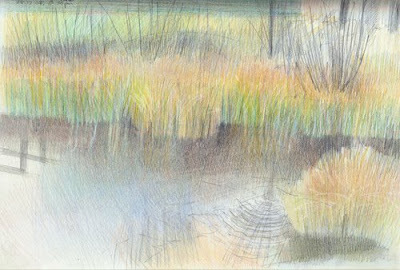 The reeds are a peculiar mix of yellow ochre and true blue/green at this time of year with lots of raw umber thrown in. What was particularly nice was that the sun was setting behind me and as I was sketching the apricot coloured sky started to appear at the front edge of the pond and coloured the section which wasn't under ice. I'm going to be doing a series of posts introducing different parts of the pond as the sketches develop. The next thing to do is to visit in the morning - which is what I've got scheduled for this morning - and it's very gray and dull outside! You can see the first 'proper' drawing I've done in Making A Mark in 2009 - The Plan. 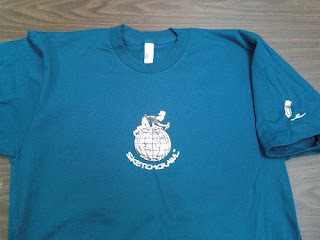 Here's a little version of it. It's of the same day but I'm looking west rather than east and at a different part of the pond - and I've begun to get a better idea of how all the reeds work!